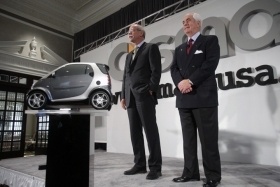 Daimler AG CEO Dieter Zetsche, left, and Penske Automotive Chief Roger Penske unveiled plans in Detroit in June 2006 to market the Smart brand in the United States starting in 2008. Mercedes-Benz has agreed to take over Smart car distribution in the United States from Penske Automotive Group, the companies announced Monday. Penske launched the European microcar brand, which is owned by Mercedes' parent, Daimler AG, as an independent distributor in 2008. But after a fast start, U.S. sales of the tiny, French-built ForTwo have plummeted. Distribution rights and management will shift to Mercedes-Benz USA. Negotiations over details, including when the hand-over takes effect, should be completed by July, said Mercedes-Benz USA CEO Ernst Lieb. The 21 Smart dealerships that do not have Mercedes products will lose the franchise, leaving Smart with 58 U.S. dealers. Four of the 21 dealerships that will lose the Smart franchise belong to publicly traded Penske Automotive. In addition, a four-door car being developed by Nissan for Smart USA has been canceled. Smart USA President Jill Lajdziak will remain with Penske Automotive, the nation's second-largest auto retailer. Mercedes-Benz will run Smart as a division, similar to its Sprinter commercial vehicle unit, and will appoint a general manager, Lieb said. Lieb said an agreement was signed Friday, but financial details have not been hammered out. Mercedes initiated the discussions with Penske in early January at the Detroit auto show, he said. Penske got off to a roaring start with Smart, selling 24,622 cars in the United States in 2008, as gasoline prices reached record highs. But sales have tumbled in the past two years -- falling 59 percent in 2010 to 5,927. But both parties said Smart's shrinking sales are not prompting the hand-over. 1. It needs more small-car volume to meet new corporate average fuel economy standards that take effect in the United States in the 2016 model year. 2. Daimler AG integrated Smart into the Mercedes-Benz car unit in September. The United States is the only market where Smart and Mercedes operate separately. “It has become clear over the last few months that Smart is an integral part of our achieving the fuel economy targets of 2016,” Lieb said. Smart's fuel economy numbers are already included in Mercedes' corporate average. But Mercedes executives believe they can increase Smart's sales volume, and thus have a greater impact on the company's CAFE ratings. Penske Automotive will handle termination of the 17 non-Mercedes-Benz dealers as part of the deal. Penske Automotive CEO Roger Penske said the closings will include the buyback of signs, equipment and cars -- in accordance with the franchise agreement. Mercedes-Benz could give Smart franchises to other Mercedes-Benz dealers, but Lieb said they would not be required to build stand-alone facilities. Lieb said 300 of Mercedes-Benz' 353 U.S. dealers have upgraded their showrooms to the Autohaus corporate facility program. Smart dealers in the United States sell the ForTwo and an electric version of the microcar. The brand isn't scheduled to receive a new vehicle for two or three years. That will be a four-door being developed with Renault/Nissan as part of an alliance with Mercedes-Benz. A separate Nissan-based four-door that has been under development for Smart USA won't happen. That car was due to be launched in late 2011 or early 2012. The Mexican-built car, which had been dubbed Project Quattro, could be canceled at any time according to the agreement with Nissan. Roger Penske said Mercedes-Benz has the marketing muscle that Smart needs. “We have launched a brand we can hand off to MB-USA,” he said. “We couldn't give it the muscle that it needed from a marketing standpoint based on the volume. He said Mercedes will interview Smart's 20-plus employees to fill field and technical posts. Michael Cantanucci, owner of New Country Motor Cars Inc., which has two Mercedes stores in Florida and one in Connecticut, said combining Smart and Mercedes makes sense because of the CAFE requirements.